Deep in the heart of Church Hill, where cobblestone boulevards give way to single-letter street names, the local Salvation Army Boys and Girls Club is in the midst of extensive renovation and expansion, a process that critics say comes at the expense of the area’s black community. “This is textbook gentrification at it’s best. Anyone that disagrees has a motive that does not consider the impacted community members and legacy of Church Hill and the club,” said Lorraine Wright. Wright used to serve on the advisory board for the club, spearheading youth development workshops and a debate team within the organization, which she says suffered from poor conditions and unusable areas long before 2018. Most recently, the club’s services have moved into a single open space at the Franklin Military Academy while the club’s facility undergoes a year-long, $6.1 million renovation that will herald a shift in the club’s focus toward education, health, and fitness. Wright brought increased attention to the club’s changes in a Facebook video condemning the firing of longtime club employees Dorothy J. Crenshaw and LaWanda Rowe, formerly the club’s program director (26 years) and administrative assistant to the director (38 years) respectively. The firing occurred with no notification given to the advisory board, and led to two separate work complaints being filed with the U.S. Equal Employment Opportunity Commission, with help from former Richmond City Council member Sa’ad El-Amin. Those complaints were eventually denied, however, and Crenshaw and Rowe have both shifted their focus on to other pressing matters in their lives, according to Wright. This marks the latest development in a still-contentious issue, one that Wright sees as a deliberate effort to draw wealthier new residents into the area, at the expense of long-term residents and underrepresented citizens and without the purview or input of the community or those meant to give guidance on the club’s direction. Despite the club’s name, the Boys and Girls Club of America are involved very little in its operation, leaving the Salvation Army, and local leader Captain Donald Dohmann, to determine its future. For Dohmann, that means leaving any legal challenges to the organization’s lawyers, after what he says have been repeated attempts to reach a compromise with Crenshaw, Rowe and Wright, with no success. Wright disputes Dohmann’s interpretation of the events leading up to the complaint filings, which she and Rowe have described as being much more dismissive of the former employees’ contributions. They also disagree on a proposed raise of pool fees from $15 annually to $20 monthly, which Wright says was only removed after community pushback, and Dohmann contends was never part of the renovation plans. Regardless of the complaints’ dismissal, the conflict over the club’s future could have a potentially wider effect on Richmond society, as El-Amin and Wright have discussed introducing ordinances to the City Council that would put “a moratorium on increases in taxes” and restrict how much properties in areas undergoing gentrification can be improved, as a way of mitigating or stopping the impact that rising property values can have on long-time residents with lower incomes. Wright, for her part, expressed her intent to reach out to Councilman Parker Agelasto, formerly of the 5th District, “to discuss his potential support of the ordinance proposals, prior to his term expiration.” She also affirmed her commitment to establishing a community board for the club, made up of and controlled by indigenous or long-term Church Hill area residents. This proposed board would potentially allow Crenshaw and Rowe to continue serving Union Hill’s community, in a space distanced from the organization through which they did that same work for decades. Is there anything more alluring than the thrill of traveling: the precipice of stepping into the unknown, the enchantment of far away lands, the freedom of an open road? Or just having some stranger at an airport of a roadside rest stop eyeball you up and down like a travel-sized toothpaste? Well, if that’s your bag, then this week’s Missed Connections are right there with you. From saucy domestic flights with mustachio’d men, road-side encounters at rest-stops, and dashing encounters at a highway Cracker Barrel, there is a little something in here for every discerning adult looking for love. As Shakespeare once said, “Speak low if you speak love.” Get amongst it, Richmond. I commented on one of your tattoos, would love to have a cuppa with you. Interested? Reply with the tattoo I commented on. You were consuming your pancakes and we engaged in conversation twice. Once, about a childhood game of yours displayed on the wall. Another, about your prior days of competitive athleticism. The staff said you’ve been frequenting that establishment for many years, and they all appeared to know you. In the end, I really enjoyed your conversation about various things of yesteryear. I wouldn’t mind chatting again sometime? You were the tall blonde with glasses and (I think white shorts). We stared at each other every time we walked by (tall guy). My friend got sick right as I was about to come over and say hi. Maybe send me a pic or your name and i’ll find you on FB? you – young guy with a mustache that came from LAX to Dulles then to Richmond. we made eyes a couple times on the flight to Dulles. i was thrilled to see you on my flight to Richmond. you were wearing a maroon shirt and were really cute. if you’re my mustached man – what item were you carrying on the flight to Richmond? I saw you at a rest stop on 95S near Fredericksburg. We made eyes. I followed you back onto 95S, we weaved our way through Richmond and then onto 85S. Totally road flirting! You pulled off into a rest stop I didn’t see and missed. I was driving a beautiful gray Jeep with a Capitals decal on the back. My hair is strawberry blonde. We sat next to each other waiting on our flight from Chicago to Richmond, love your smile, you caught me few time[s] looking at this beautiful face. Wish I can see you again! These stories originally appeared in GOOD EATS RVA in RVA #33 Summer 2018. You can check out the issue here, or pick it up around Richmond now. This summer, Michelle Parrish is hoping to serve busy working families in the Church Hill community more affordable and nutritious options. 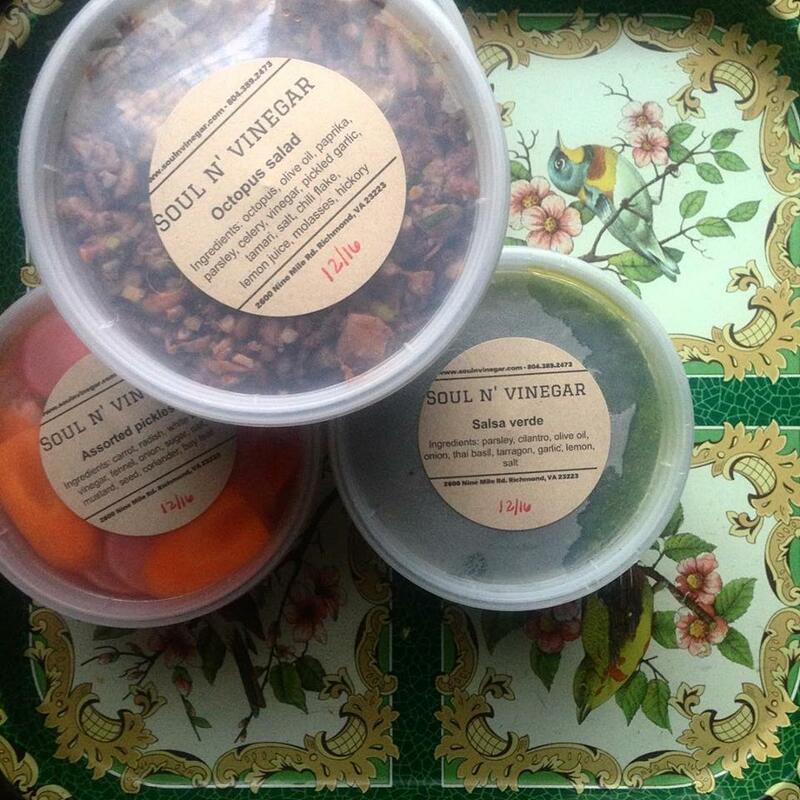 Her forthcoming grab and go food shop, Soul N’ Vinegar, will open in the former Ruth’s Beauty Shop spot on R Street, selling vegetarian, gluten-free, and other healthy lunch and dinner options, along with beer and wine. Residents can expect a variety of packaged to-go meals and sides, from octopus salad to pickled veggies, homemade salsa verde, vegetarian curries, and mac and cheese. Originally from Massachusetts, when Parrish moved to Church Hill a couple of years ago she wasn’t aware of the food deserts that plague certain areas of the city. Living only a couple of blocks away from the shop, she said she felt a calling to it while she was earning her business degree at J Sarge last year. With the urge to revive the shuttered building and offer Church Hill residents affordable fresh food, she enrolled in a free business course through the Office of Minority Business Development. After that, she decided to focus all her efforts on getting Soul N’ Vinegar up and running. She took a semester off and applied for funding through LISC and Bon Secours’ SEED grant program, which strives to jumpstart small Church Hill businesses. Parrish was awarded $20,000, which gave her the boost she needed to launch the market. “Up until that point, everything was a daydream,” she said. About 80 percent of the food at Soul N’ Vinegar will be vegetarian, keeping costs low to cater to a wide range of people in that community. Prior to leasing her space, Parrish held pop up events at Sub Rosa and catered for local companies, offering boxed lunches and other snacks including deviled eggs, pimento cheese sliders, smoked chicken salad, and honey cake with candied orange. She plans to continue the catering after the market opens. Parrish said there will seating for six inside, but she will expand with a 15-seat patio after they open sometime this summer. Editor’s Note: Soul N’ Vinegar has opened since RVA Magazine went to press. The owner of Manchester coffee shop Brewer’s Café will open a spot this fall just down the road from his Bainbridge Street location for those with a sweet tooth. Leasing two spaces at 1309 and 1311 Hull St., Ajay Brewer will not only serve up waffles, alcoholic milkshakes, and lunch fare at his new place, Brewer’s Waffles & Milkshakes, but also will use one half of the building as an art gallery. Plans didn’t get cooking for the shop until a few months ago, but expansion has been churning in Brewer’s mind since last summer. The café owner and former stockbroker, who opened his shop about three years ago, has played a significant role in bringing people to the neighborhood, launching the monthly Manchester Manifest on first Fridays and drawing in customers recently with “Wu-Tang Sandwich Week.” The proceeds from this collaboration with Wu-Tang Clan members to create some of their favorite sandwiches went to benefit Richmond Public Schools. “The whole idea is to create a community right here where we live in Southside. Doing what I can to make this population better. I truly feel like we can change the world, we just have to start with these communities,” Brewer said. Brewer said plans for the new shop came together rather smoothly. “I got a call from the landlord a couple of months ago, he wanted to lease the space. He was like, ‘You can have both spaces if you want it, we just really want to get this café idea out,’” he said. 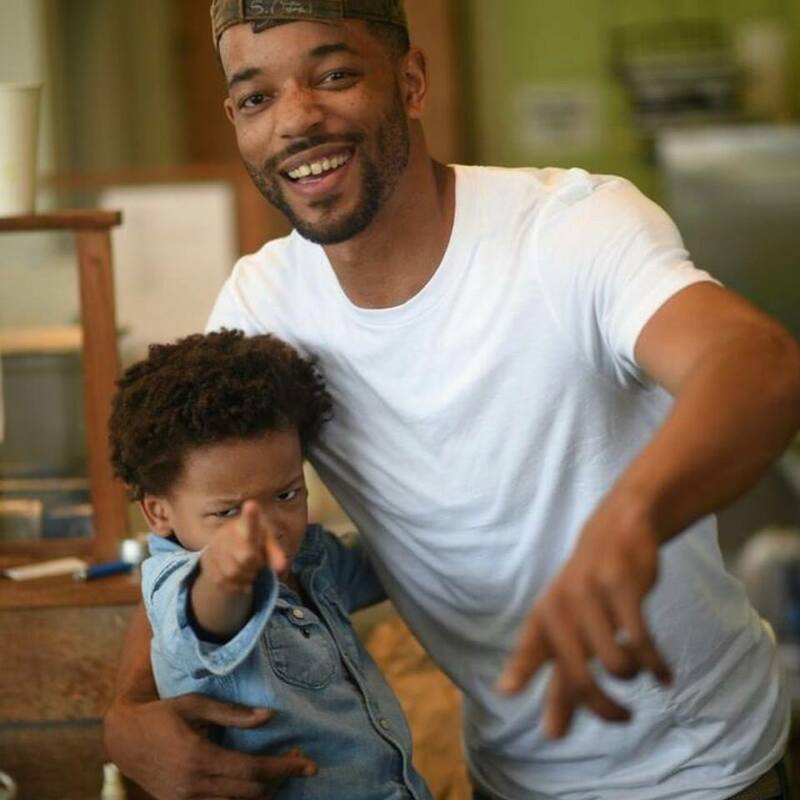 James Harris, an investor in Brewer’s Café, was also looking to dive into his next venture. “He was itching to do something else, he has several businesses and all that came to me around the same time so what would we do became the question,” he said. Brewer said they threw around different ideas for the Hull Street location such as a biscuit restaurant, ice cream shop, even burgers, but ultimately, he knew he wanted to serve the fluffy, golden brown treat. The menu is in the beginning stages, but Brewer plans to have savory dishes like chicken & waffles and waffle sandwiches that come with sausage, along with a toppings bar with strawberries and other sweeter options. To satisfy the lunch crowd, the shop will also serve sandwiches and salads, with vegetarian and gluten-free options. Sodas from Union Hill’s Roaring Pines are also on the menu, as well as alcoholic milkshakes, so whether you’re an early riser or a night owl who likes their midnight munchies, Brewer’s forthcoming spot plans to cater to everyone. As for the art gallery, the spaces will be connected so patrons can walk between the two, and Brewer hopes to showcase art from near and far. “Personally, I’m an art lover. I’m not really pretending this is something that interests me,” he said. “This space, obviously I’m going to open up for locals too, but I would hope to attract regional, national, and international artists. I’d love for the art space to be an attraction that brings in talent across the world.” His goal is to host exhibits and other gallery openings once he reaches out to community artists. Brewer’s Waffles & Milkshakes will open sometime in September, operating from 7 am to 2 am seven days a week. A few years ago Scott’s Addition was a largely forgotten industrial neighborhood only the savviest Richmonders knew to be good for lunch or a milkshake. Since then the countless breweries, lofts, and coworking spaces that have sprouted up transformed Scott’s Addition into the epicenter of the city, Richmond’s hip, forward-thinking vision for itself. Richmond has seen a version of this story before with Tobacco Row and the Canal Walk; however, the city’s vast supply of vacant former industrial space is a thing of the past. Richmond’s most enticing empty spaces have been filled, and now gentrification is spilling over into affordable—and predominantly black—neighborhoods like Jackson Ward and North Church Hill. Rising costs and stagnant wages combined with gentrification are fueling the American eviction crisis, an epidemic that has been keenly felt in Richmond and across the Commonwealth. After a conversation with Councilwoman Cynthia Newbille over how to help combat the problem, Laura Lafayette, CEO of the Richmond Association of Realtors, founded the Maggie Walker Community Land Trust, named after a local hero who was the first woman to charter a bank in the United States, in 2016. 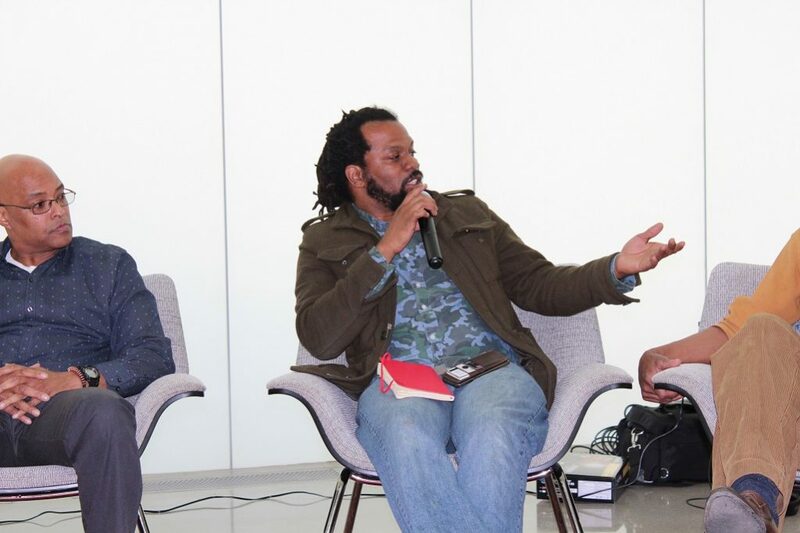 The program enables prospective homeowners to buy property without paying for the land it sits on; the land remains in the hands of the trust in perpetuity. This means home buyers only need to finance the cost of the house, thus vastly reducing the size of the loan needed and creating access for buyers with less financial power. Land trusts serve as the solution for one of two problems depending on the market they’re operating in: Gentrification or neighborhood destabilization. 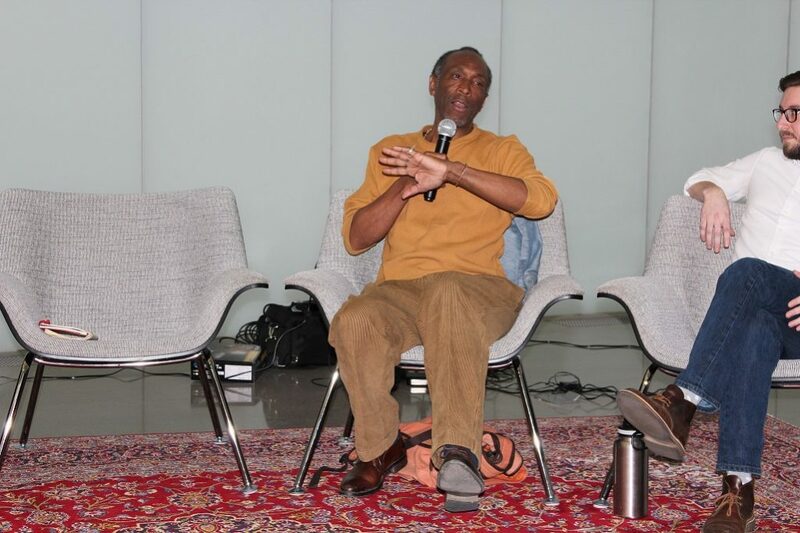 “In a few years the only affordable options in Church Hill and the East End may be land trust homes,” worries Nikki D’Adamo-Damery, coordinator for the Maggie Walker Community Land Trust. Along Chesterfield’s North Jeff Davis corridor a land trust could help people into vacant homes and tie them to those communities. Recent legislation from City Council deemed the Maggie Walker Community Land Trust Richmond’s official “land bank,” giving it the further ability to receive and repurpose vacant, abandoned, and foreclosed properties. If the city were to forsake auctioning off such blighted properties to private developers and instead give them to the land trust, then Richmond’s newest tool in its affordability arsenal would have a lot more firepower. 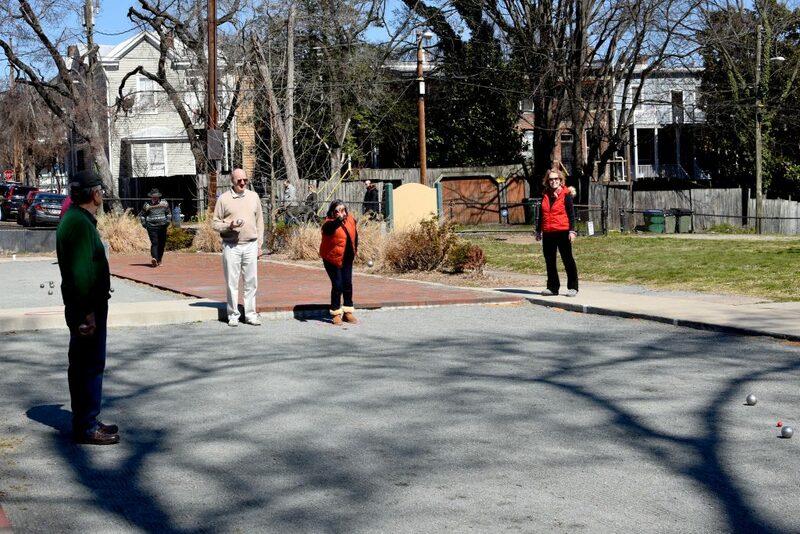 It’s a beautiful early spring afternoon, and members of Les Boulesfrogs, Church Hill’s only pétanque club, are gathered at Chimborazo Park. Nineteen members and three newcomers, including this reporter, are here to play the bocce-like French game, where teams take turns launching steel boules at a small wooden ball called the cochonnet (“piglet”). 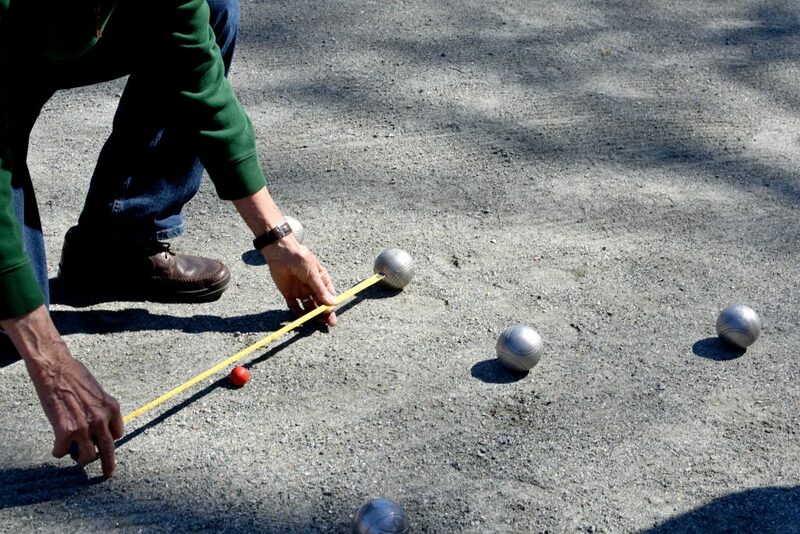 “Pétanque is Provence patois for both feet together,” club president and founder Richard Taranto tells me when I first arrive, walking me through the rules. He’s playing opposite John and Benedict Whitworth, a married couple originally from England and France respectively, who joined the group when Taranto and his wife, Kirsten, founded it in 2005. 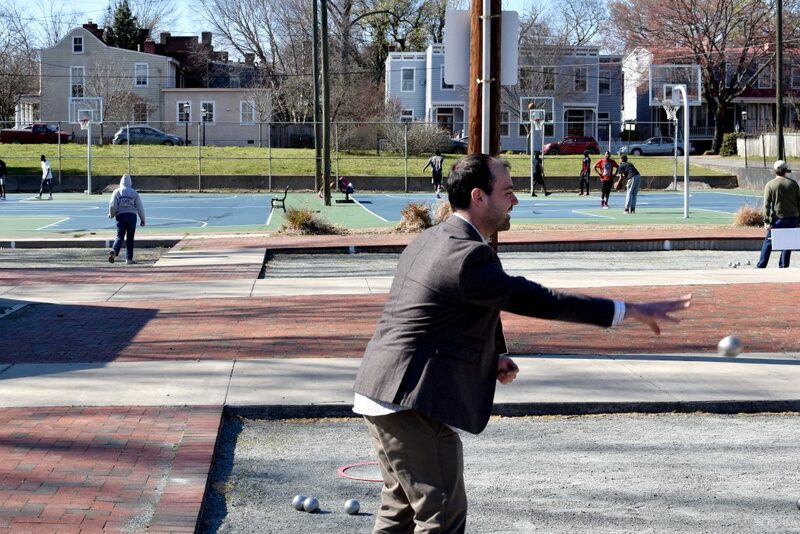 He also points out the lack of physical restrictions, something pétanque shares with bocce. Although she’s not present today, one member, Sheila Luellen, plays from her wheelchair. On this Saturday, ages range from a 28-year-old to a few people “in their 80s,” said Taranto when I ask him after his turn. Their youngest dues-paying member–dues are $30 per year, split evenly between insurance and equipment purchases–is 20, but currently off at college. “We haven’t had to use it, but it’s a good idea,” Benedict said about the insurance, noting that this spot in Chimborazo is an active area for families, dog walkers, and others. Near the intersection of East Grace and North 29th streets, the eight courts are adjacent to a popular basketball court and a small play area. After a bit of reassurance, I’m pulled in to play a game myself, convinced by John, who said it’s a mixture of skill and luck. Players self-organizing as pointers or shooters; the latter try to position their boules near the cochonnet while the former knock their opponents’ boules away. As a rookie who doesn’t really know the difference, I line up with the pointers and join team sorting by throwing a borrowed boule at a cochonnet. My boule is closest to John’s, so by a stroke of luck, I’m paired up with the British shooter and, in my opinion, pétanque shark. Amid friendly ribbing from our opponents, we talk strategy and basic rules. I need to land more of my three boules closer to the cochonnet than our opponents do; John on his turn will choose between knocking out their boules or trying to score alongside mine. Rounds end with scoring after all boules are thrown, with a simple system familiar to anyone who’s watched curling. Only the leading team scores in a round, gaining one point per boule closer to the cochonnet than the closest boule of the losing team. Just as in curling, measuring is part of the game. It’s not always possible to tell by sight alone which boule is closest. “If there is ever a question, we always measure, and we always take the word of the measurer,” John said. For a first game, it couldn’t go better. After giving me a do-over on my first round (not normally allowed), we win almost every successive one. Whichever team wins begins the next round by throwing out the cochonnet to establish the target for each team’s six boules. We win 13 to 2, making for a short game of only eight rounds. Hypothetically, a game can be as short as three and as many as twenty-five rounds. Basking in glory, I head over to the snack table, where members are eating peanuts during a mid-game social break. Many of the players were exposed to the game overseas, like Mark Rankin, a French teacher at George H. Moody Middle School in Henrico. “I first saw it when I was living in France,” he said, talking about a few years when he taught English overseas. He teaches his students how to play now, too, and some stick with the game outside of the classroom. For another player, newcomer Todd Van Gordon, the introduction to boules games came while living in Venezuela, where he played bolas criollas. “We played on rough ground there, which makes it very interesting,” he said. This club used to play on rough ground too, said Rankin, on a few of the back alleys, but they built the courts in Chimborazo several years ago in partnership with the city of Richmond. Van Gordon first found Les Boules Frogs by chance, as many do, while walking his dog through Chimborazo park, and then joined after meeting some players at a neighborhood gathering. That’s essentially the recruitment strategy. Although not here today, Kirsten was my introduction to the club, striking up a friendly conversation with me at the downtown YMCA where I was covering another story and inviting me to come out and play. The couple played in a club up in Northern Virginia before they moved here in 2005 and sought to recreate the experience here partially as a way to meet people and make friends in their new home. By any metric, it was a success; from a blurb in the Church Hill Newsletter that brought out ten neighbors, they’ve grown to a club of some fifty regular members. It’s the only club in the region, and shares some members with the local Alliance Française chapter, but you don’t need to be a francophone to join. Whether you’re looking for a new hobby or just want to enjoy some of this lovely spring weather, you won’t go wrong with the friendly folks at Les Boulesfrogs of Church Hill.